How we could fall into another housing crisis before we’ve fully pulled out of the 2008 one. When it comes to housing, sometimes it seems we never learn. Just when America appeared to be recovering from the last housing crisis—the trigger, in many ways, for 2008’s grand financial meltdown and the beginning of a three-year recession—another one may be looming on the horizon. There are at several big red flags. For one, the housing market never truly recovered from the recession. Trulia Chief Economist Jed Kolko points out that, while the third quarter of 2014 saw improvement in a number of housing key barometers, none have returned to normal, pre-recession levels. Existing home sales are now 80 percent of the way back to normal, while home prices are stuck at 75 percent back, remaining undervalued by 3.4 percent. More troubling, new construction is less than halfway (49 percent) back to normal. Kolko also notes that the fundamental building blocks of the economy, including employment levels, income and household formation, have also been slow to improve. “In this recovery, jobs and housing can’t get what they need from each other,” he writes. Americans are spending more than 33 percent of their income on housing. 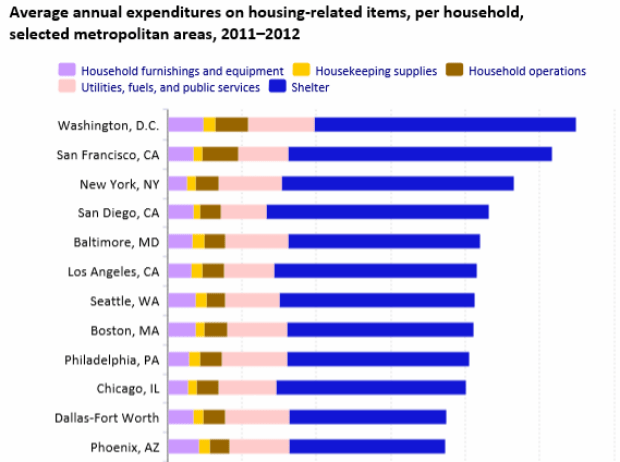 Second, Americans continue to overspend on housing. Even as the economy drags itself out of its recession, a spate of reports show that families are having a harder and harder time paying for housing. Part of the problem is that Americans continue to want more space in bigger homes, and not just in the suburbs but in urban areas, as well. Americans more than 33 percent of their income on housing in 2013, up nearly 13 percent from two decades ago, according to newly released data from the Bureau of Labor Statistics (BLS). The graph below plots the trend by age. The result, of course, is that more and more American households, especially middle- and working-class people, are having a harder time affording housing. This is particularly the case in reviving urban centers, as more affluent, highly educated and creative-class workers snap up the best spaces, particularly those along convenient transit, pushing the service and working class further out. Home ownership currently hovers from the mid-50 to low-60 percent range in some of the most highly productive and innovative metros in this country—places like San Francisco, New York, and Los Angeles. This range seems “to provide the flexibility of rental and ownership options required for a fast-paced, rapidly changing knowledge economy. Widespread home ownership is no longer the key to a thriving economy,” I’ve written. What we are going through is much more than a generational shift or simple lifestyle change. It’s a deep economic shift—I’ve called it the Great Reset. It entails a shift away from the economic system, population patterns and geographic layout of the old suburban growth model, which was deeply connected to old industrial economy, toward a new kind of denser, more urban growth more in line with today’s knowledge economy. We remain in the early stages of this reset. If history is any guide, the complete shift will take a generation or so. It’s time to impose stricter underwriting standards and encourage the dense, mixed-use, more flexible housing options that the knowledge economy requires. The upshot, as the Nobel Prize winner Edmund Phelps has written, is that it is time for Americans to get over their house passion. The new knowledge economy requires we spend less on housing and cars, and more on education, human capital and innovation—exactly those inputs that fuel the new economic and social system. But we’re not moving in that direction; in fact, we appear to be going the other way. This past weekend, Peter J. Wallison pointed out in a New York Times op-ed that federal regulators moved back off tougher mortgage-underwriting standards brought on by 2010’s Dodd-Frank Act and instead relaxed them. Regulators are hoping to encourage more home ownership, but they’re essentially recreating the conditions that led to 2008’s crash. Wallison notes that this amounts to “underwriting the next housing crisis.” He’s right: It’s time to impose stricter underwriting standards and encourage the dense, mixed-use, more flexible housing options that the knowledge economy requires. During the depression and after World War II, this country’s leaders pioneered a series of purposeful and ultimately game-changing polices that set in motion the old suburban growth model, helping propel the industrial economy and creating a middle class of workers and owners. Now that our economy has changed again, we need to do the same for the denser urban growth model, creating more flexible housing system that can help bolster today’s economy. Dream housing for new economy workers? This entry was posted in Uncategorized and tagged adjustable rate mortgage, America, American middle class, Bank of America, BLS, Boston, Breaking News, Bureau of Labor Statistics, California, California Assn. of Realtors, cash withdrawals, Catherine Austin Fitts, Census Bureau, CFPB, Chief Economist Jed Kolko, China, CitiGroup, Climate Change, commercial real estate, Consumer Financial Protection Bureau, DataQuick, Deutsche Bank, Energy, Fannie Mae, FHA, financial markets, Food, foreclosure, Goldman Sachs, Home Building, Housing, housing bubble, housing crisis, housing market, HSBC, LA Times Southern California home buyers, Lifestyle, Living, Los Angeles, Midland, Midland Texas, New Economy, New Youk, Permian Basin, Texas on November 12, 2014 by Bone Fish. The dramatic resurgence of the oil industry over the past few years has been a notable factor in the national economic recovery. Production levels have reached totals not seen since the late 1980s and continue to increase, and rig counts are in the 1,900 range. While prices have dipped recently, it will take more than that to markedly slow the level of activity. Cycles are inevitable, but activity is forecast to remain at relatively high levels. An outgrowth of oil and gas activity strength is a need for additional workers. At the same time, the industry workforce is aging, and shortages are likely to emerge in key fields ranging from petroleum engineers to experienced drilling crews. I was recently asked to comment on the topic at a gathering of energy workforce professionals. Because the industry is so important to many parts of Texas, it’s an issue with relevance to future prosperity. Although direct employment in the energy industry is a small percentage of total jobs in the state, the work is often well paying. Moreover, the ripple effects through the economy of this high value-added industry are large, especially in areas which have a substantial concentration of support services. Employment in oil and gas extraction has expanded rapidly, up from 119,800 in January 2004 to 213,500 in September 2014. Strong demand for key occupations is evidenced by the high salaries; for example, median pay was $130,280 for petroleum engineers in 2012 according to the Bureau of Labor Statistics (BLS). Due to expansion in the industry alone, the BLS estimates employment growth of 39 percent through 2022 for petroleum engineers, which comprised 11 percent of total employment in oil and gas extraction in 2012. Other key categories (such as geoscientists, wellhead pumpers, and roustabouts) are also expected to see employment gains exceeding 15 percent. In high-activity regions, shortages are emerging in secondary fields such as welders, electricians, and truck drivers. The fact that the industry workforce is aging is widely recognized. The cyclical nature of the energy industry contributes to uneven entry into fields such as petroleum engineering and others which support oil and gas activity. For example, the current surge has pushed up wages, and enrollment in related fields has increased sharply. Past downturns, however, led to relatively low enrollments, and therefore relatively lower numbers of workers in some age cohorts. The loss of the large baby boom generation of experienced workers to retirement will affect all industries. This problem is compounded in the energy sector because of the long stagnation of the industry in the 1980s and 1990s resulting in a generation of workers with little incentive to enter the industry. As a result, the projected need for workers due to replacement is particularly high for key fields. The BLS estimates that 9,800 petroleum engineers (25.5 percent of the total) working in 2012 will need to be replaced by 2022 because they retire or permanently leave the field. Replacement rates are also projected to be high for other crucial occupations including petroleum pump system operators, refinery operators, and gaugers (37.1 percent); derrick, rotary drill, and service unit operators, oil, gas, and mining (40.4 percent). Putting together the needs from industry expansion and replacement, most critical occupations will require new workers equal to 40 percent or more of the current employment levels. 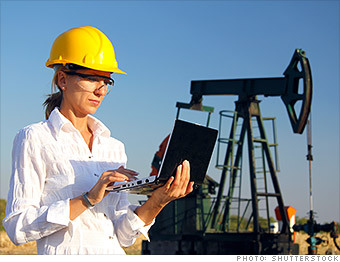 The total need for petroleum engineers is estimated to equal approximately 64.5 percent of the current workforce. Clearly, it will be a major challenge to deal with this rapid turnover. Potential solutions which have been attempted or discussed present problems, and it will require cooperative efforts between the industry and higher education and training institutions to adequately deal with future workforce shortages. Universities have had problems filling open teaching positions, because private-sector jobs are more lucrative for qualified candidates. Given budget constraints and other considerations, it is not feasible for universities to compete on the basis of salary. Without additional teaching and research staff, it will be difficult to continue to expand enrollment while maintaining education quality. At the same time, high-paying jobs are enticing students into the workforce, and fewer are entering doctoral programs. Another option which has been suggested is for engineers who are experienced in the workplace to spend some of their time teaching. However, busy companies are naturally resistant to allowing employees to take time away from their regular duties. Innovative training and associate degree and certification programs blending classroom and hands-on experience show promise for helping deal with current and potential shortages in support occupations. Such programs can prepare students for well-paying technical jobs in the industry. Encouraging experienced professionals to work past retirement, using flexible hours and locations to appeal to Millennials, and other innovative approaches must be part of the mix, as well as encouraging the entry of females into the field (only 20 percent of the current workforce is female, but over 40 percent of the new entries). Industry observers have long been aware of the coming “changing of the guard” in the oil and gas business. We are now approaching the crucial time period for ensuring the availability of the workers needed to fill future jobs. Cooperative efforts between the industry and higher education/training institutions will likely be required, and it’s time to act. This entry was posted in Uncategorized and tagged America, American middle class, Bank of America, Bank of England, Barack Obama, Breaking News, Bureau of Labor Statistics, California, California Assn. of Realtors, Census Bureau, CFPB, China, CitiGroup, Climate Change, commercial real estate, Consumer Financial Protection Bureau, Deutsche Bank, Education, Energy, Fannie Mae, Fed, Federal Housing Finance Agency, Federal Reserve, FHA, financial markets, Food, Freddie Mac, Goldman Sachs, Home Building, Housing, housing market, HSBC, interest rates, JPMorgan Chase, LA Times Southern California home buyers, labor force, Life, Lifestyle, Living, Los Angeles, Martin Hladyniuk, Midland Texas, Permian Basin, Petroleum Engineer, Pioneer Bank, Pioneer Mortgage Company, Texas, Texas Workforce Commission on November 11, 2014 by Bone Fish. 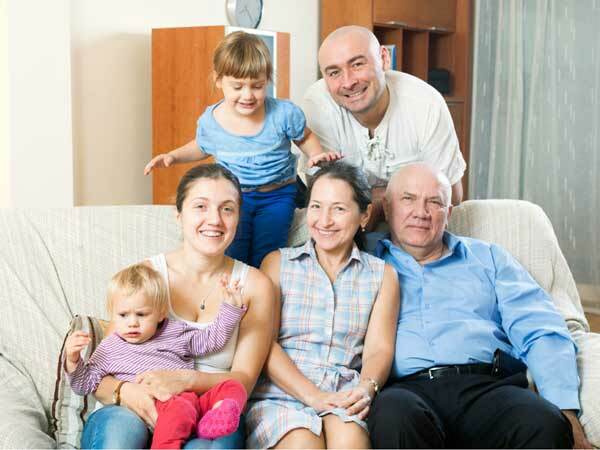 The practice of multigenerational housing has been on the rise the past few years, and now experts are saying that it is adding value to properties. In a recent Wall Street Journal article, several couples across the country are quoted saying that instead of downsizing to a new home, they are choosing to live with their adult children. And how much more are these homes worth? 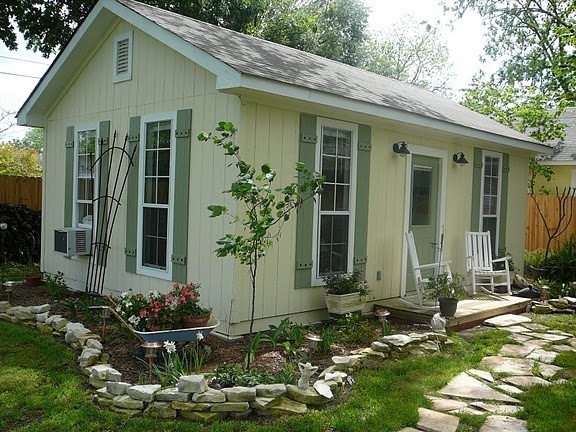 In an analysis by Zillow, the homes with this type of living accommodations were priced about 60 percent higher than regular single-family homes. Local builders are noticing the trend, too. Horsham based Toll Brothers are building more communities that include both large, single-family homes and smaller homes for empty nesters, the company’s chief marketing officer, Kira Sterling, told the WSJ. This entry was posted in Uncategorized and tagged adult children, America, American middle class, Breaking News, California, California Assn. of Realtors, CFPB, China, CitiGroup, Consumer Financial Protection Bureau, Deutsche Bank, Fannie Mae, Federal Housing Finance Agency, Food, Housing, housing bubble, Life, Lifestyle, Living, Multigenerational Housing, National Association of Home Builders, National Association of Realtors, Permian Basin, property values, Real Estate & Lending Insider, Retirement, Sales, Texas, Wall Street Journal, WSJ, Zillow on November 9, 2014 by Bone Fish. Count Dracula, the central character of Irish author Bram Stoker’s classic vampire novel, eagerly left for England in search of new blood, in a story that popularized the Romanian region of Transylvania. Today, house hunters are invited to make the reverse journey now that Romania is a member of the European Union and that restrictions were lifted this year on purchases of local real estate by the bloc’s nationals. Britain’s Prince Charles, for one, unwinds every year in Zalanpatak. The mud road leading to the remote village stretches for miles, with the clanging of cow bells accompanying tourists making the trek. Elsewhere in the world, the heir to the British throne occupies great castles and sprawling mansions. In rural Romania, he resides in a small old cottage. His involvement, since 2006, in the restoration of a few local farmhouses has given the hamlet global popularity and added a sense of excitement about Transylvania living. 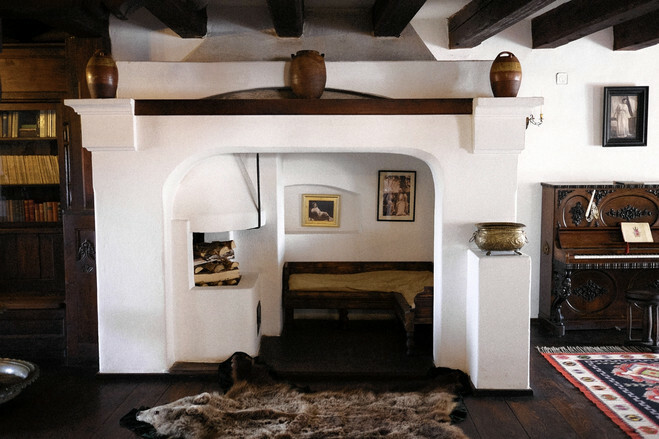 A living room in Bran Castle, a Transylvania property marketed as Count Dracula’s castle. The home is for sale, initially listed for $78 million. Transylvania, with a population of more than seven million in the central part of Romania, has a number of high-end homes on the market. And, yes, one is a castle. Bran Castle in Brasov county is marketed as the home of Count Dracula. In reality it was a residence of Romanian Queen Marie in the early 20th century. In 2007, the home was available for $78 million. The sellers are no longer listing a price, said Mark A. Meyer, of Herzfeld and Rubin, the New York attorneys representing the queen’s descendants, but will entertain offers. Foreign buyers had been focused on Bucharest, where there was speculative buying of apartments after the country joined the EU in 2007. 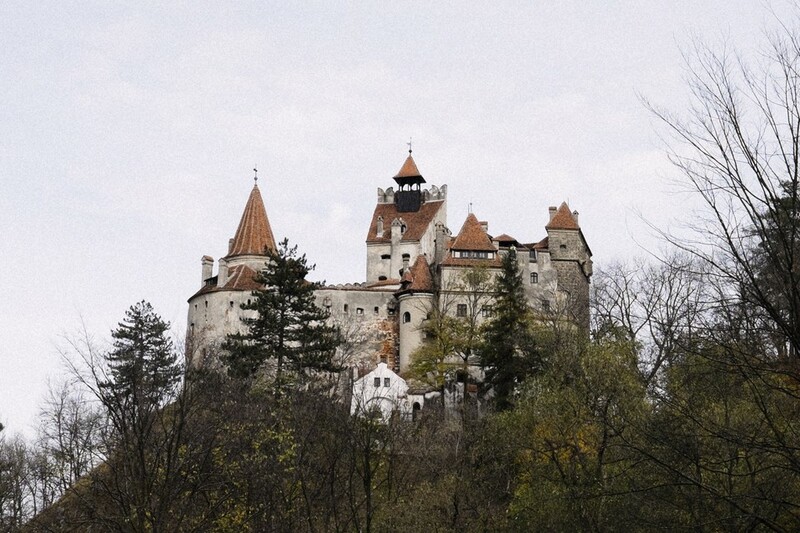 But Transylvania has been luring house hunters away from the capital city. A guesthouse on the property in Zalanpatak, Transylvania, that is owned by Britain’s Prince Charles. His presence has boosted interest in Romanian real estate. Transylvania means “the land beyond the forest” and the region is famous for its scenic mountain routes. Brasov, an elegant mountain resort and the closest Transylvanian city to the capital, has many big villas built in the 19th century by wealthy merchants. A 10-room townhouse from that period in the historic city center is listed for $2.7 million. For $500,000, a 2,200-square-foot apartment offers rooftop views of the city and the surrounding mountains. A seven-bedroom mansion in the nearby village of Halchiu, close to popular skiing resorts, is on the market for $2.4 million. The modern villa features two huge living rooms, a swimming pool, a tennis court and spectacular views of the Carpathian Mountains. The village, founded by Saxons in the 12th century, has rows of historic houses across the street. Four such buildings were demolished to make way for the mansion, completed in 2010. A $2.4 million mansion is for sale in Halchiu village. 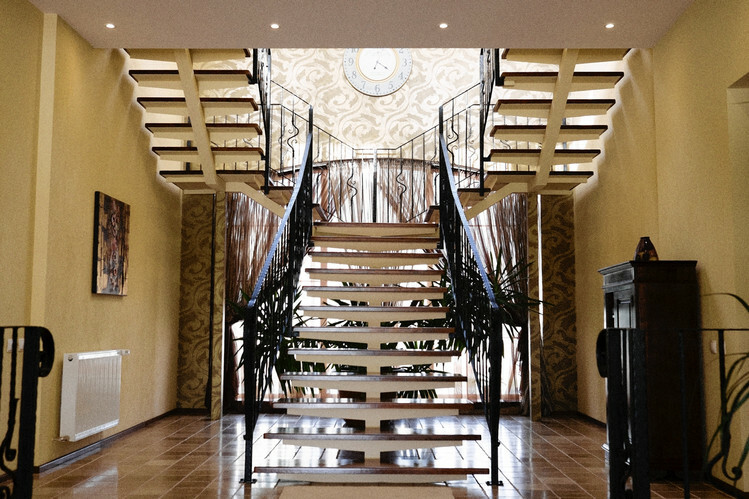 “Rather than invest a million or more to buy an existing house, the wealthy prefer to build on their own because construction materials and work is cheaper,” said Raluca Plavita, senior consultant at real-estate firm DTZ Echinox in Bucharest. Non-EU nationals can’t purchase land outright—although they may use locally registered companies to circumvent the restriction—but they can buy buildings freely, said Razvan Popa, real-estate partner at law firm Kinstellar. High-end properties are out of reach for many Romanians, who make an average of $500 in monthly take-home pay. The country saw a rapid inflation of real-estate prices before 2008, on prospects of Romania’s entry to the EU and the North Atlantic Treaty Organization, as well as aggressive lending by banks. Values then fell by half during the global financial crisis. The economy is stronger now, with the International Monetary Fund estimating 2.4% growth this year. But the country is still among Europe’s poorest. Its isolation during the dictatorship of Nicolae Ceausescu gave it a bad image. The interior of the seven-bedroom Halchiu mansion, which was built on the site of four traditional Saxon homes. “Interest in Romania isn’t comparable with Prague or Budapest where some may be looking to buy a small apartment with a view of Charles Bridge or the Danube,” said Mr. Popa, the real-estate lawyer. The international publicity around Prince Charles’s properties offers a counterbalance to some of the negative press Romania has received in Western Europe, which is worried about well-educated Romanians moving to other countries to provide inexpensive labor. 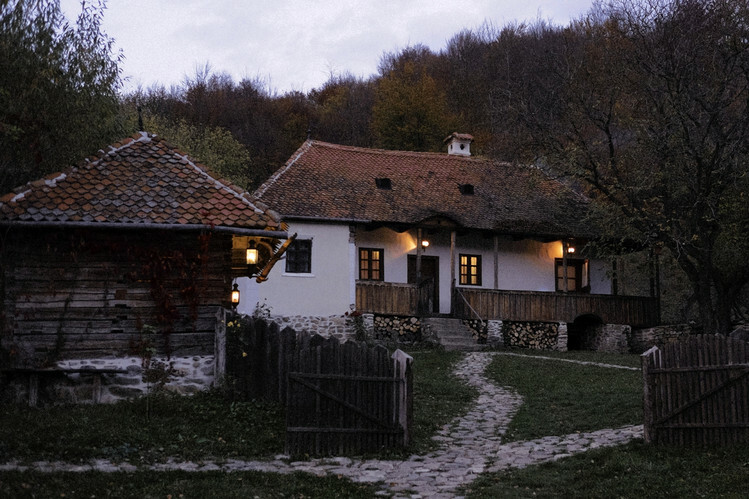 The Zalanpatak property is looked after by Tibor Kalnoky, a descendant of a Hungarian aristocratic family. The 47-year-old studied in Germany to be a veterinarian and, after reclaiming family assets in Romania, has managed the prince’s property and has hosted him during his visits. These occasional visits are enough to attract scores of tourists throughout the year to the formerly obscure village in a Transylvanian valley. The fact that few street signs lead there, that the property offers no Internet or TV and that cellphone signals are absent for miles, seems only to add to the mystery of the place. This entry was posted in Uncategorized and tagged America, Bran Castle, Breaking News, Bucharest, Castle, China, Count Dracula, Europe, Food, Holliday, House Hunters, Housing, Life, Lifestyle, Living, Los Angeles, Mansion, Martin M. Sobczyk Count Dracula, member of the European Union, Money, National Association of Realtors, New York, Prince Charles, Resort Areas, Romania, Russia, Texas, Transylvania, United States, Vacation, Villa, Whiskey Tango Texas, Wordpress on November 8, 2014 by Bone Fish. 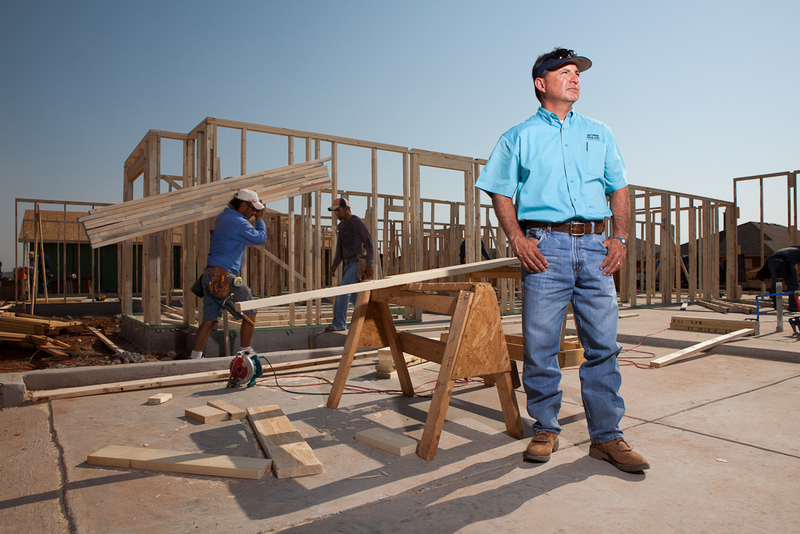 Kenny DeLaGarza, a building inspector for the city of Midland, at a 600-home Betenbough development. Single-family home construction is expected to increase 26 percent in 2015, the National Association of Home Builders reported Oct. 31. NAHB expects single-family production to total 802,000 units next year and reach 1.1 million by 2016. Economists participating in the NAHB’s 2014 Fall Construction Forecast Webinar said that a growing economy, increased household formation, low interest rates and pent-up demand should help drive the market next year. They also said they expect continued growth in multifamily starts given the nation’s rental demand. The NAHB called the 2000-03 period a benchmark for normal housing activity; during those years, single-family production averaged 1.3 million units a year. The organization said it expects single-family starts to be at 90 percent of normal by the fourth quarter 2016. NAHB Chief Economist David Crowe said multifamily starts currently are at normal production levels and are projected to increase 15 percent to 365,000 by the end of the year and hold steady into next year. The NAHB Remodeling Market Index also showed increased activity, although it’s expected to be down 3.4 percent compared to last year because of sluggish activity in the first quarter 2014. Remodeling activity will continue to increase gradually in 2015 and 2016. Moody’s Analytics Chief Economist Mark Zandi told the NAHB that he expects an undersupply of housing given increasing job growth. Currently, the nation’s supply stands at just over 1 million units annually, well below what’s considered normal; in a normal year, there should be demand for 1.7 million units. Zandi noted that increasing housing stock by 700,000 units should help meet demand and create 2.1 million jobs. He also noted that things should level off by the end of 2017, when mortgage rates probably will rise to around 6 percent. “The housing market will be fine because of better employment, higher wages and solid economic growth, which will trump the effect of higher mortgage rates,” Zandi told the NAHB. States with the healthiest job growth include Louisiana, Montana, North Dakota, Texas and Wyoming, as well as farm belt states like Iowa. Meanwhile Alabama, Arizona, Nevada, New Jersey, New Mexico and Rhode Island continue to have weaker markets. This entry was posted in Uncategorized and tagged adjustable rate mortgage, America, Bank of America, Bank of England, Breaking News, Bureau of Labor Statistics, California, California Assn. of Realtors, Census Bureau, CFPB, China, CitiGroup, commercial real estate, Consumer Financial Protection Bureau, DataQuick, Deutsche Bank, Economics, Fannie Mae, Fed, Federal Housing Finance Agency, FHA, FHFA, financial institutions, Freddie Mac, Goldman Sachs, Home, Home Building, housing market, Life, Living, Moodys, NAHB, National Association of Realtors, Pioneer Bank, Pioneer Mortgage, Real Estate.Texas, Wells Fargo on November 7, 2014 by Bone Fish. Receive Easy Money email notification of new articles. Guess How Much Americans Spend Drunk Shopping Online? About: Easy Money is a non-monetized hobby blog provided for WordPress subscribers interested in socio-economic-financial news topics followed by the publisher. Material in this blog is not presented to generate interest in or represent a solicitation for services. Fair Use Disclaimer: Copyright disclosure under section 107 of the copyright act 1976 allowance is made for ‘Fair Use’ for purposes such as criticism, comment, news reporting, teaching, scholarship, satire and research. Fair use is a use permitted by copy right statute that might otherwise be infringed. Non-profit, educational or personal use tips the balance in favor of fair use. Easy Money is a non-monetized personal use hobby blog that is not indexed or featured on business websites, search, social or review platforms for commercial or political purpose. All posts contain no original or promotional content intended to generate interest, leads, or revenue for the publisher. All material is provided for non-commercial, educational and informational use. Publisher simply quotes excerpts through fair usage, displaying author, publication and hyperlink(s) to source(s) when available. Publisher does not claim any rights to material gathered and published from other sources. It is all fully owned by those sources. If you use copyrighted material discovered on this blog for purposes that go beyond fair use, you must obtain permission from the copyright owner. Fair use notwithstanding, publisher will work with verified copyright owners who request in writing, including full contact information via the comment section, to modify or remove their copy written material from this blog. © martinhladyniuk.com, all rights reserved.